Cycling is one of the most frustrating parts about setting up a new aquarium. That’s not because it’s hard – it isn’t. Especially if you follow FishLab’s step-by-step cycling guide. 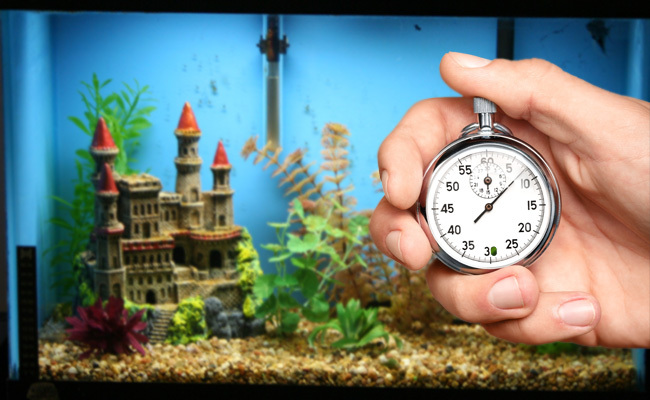 It’s the excruciatingly long time that it takes for your tank to cycle that is the issue – sometimes up to two months! That’s two months before you can safely add fish into your aquarium. It’s a darn long time. Wouldn’t it be great if there was a faster way to cycle your tank? Today, I am going to take you through the different ways you can speed up your cycle. How do you speed up the instant cycle? Wouldn’t it be great if you could add your fish to your new tank on the same day that you set it up? There are all kinds of products and techniques that promise to cycle your aquarium in just one day. Yep just 24 hours later, your tank is deemed fish-safe. Some go a step further and claim to instantly cycle your aquarium. This is what I like to call a beginner trap. If you don’t know any better, being able to cycle your aquarium instantly sounds perfectly realistic. If you have tried before, then you are fully aware that aquarium cycling is anything but instant. I have personally heard of beginners who claimed that they successfully cycled their aquarium in under a day. However, after testing their ammonia and nitrites with an aquarium test kit, they discovered that their tank was actually unsafe for their fish. You see, the problem is that ammonia and nitrites are invisible. And at low levels, fish are often not noticeably distressed. This can fool a beginner into thinking that their tank is safe. Meanwhile, their fish are suffering. So please, don’t go into this thinking that you can instantly cycle your aquarium – it ain’t gonna happen! With that said, there are ways to shorten the time it takes to cycle your tank. And best of all, the methods that I cover in this guide have been proven to work. How do you speed up the cycling process? Remember how I said that there is no such thing as an instant cycle? Well, that’s still true. But there are a couple of methods that you can use to kick-start your cycle, drastically shortening the cycle time. As always, how much quicker these methods make your cycle vary from tank to tank. For some, it will drastically shorten the entire process, while for others it may only shave off a couple of days. Remember… When it comes to cycling your tank YMMV, your mileage may vary. The only constant is patience. It doesn’t matter what you do to your tank, you won’t be able to speed up your nitrogen cycle unless you have the basics. If you don’t have good fundamentals, your nitrogen cycle won’t start or worse, it will stop halfway through – that’s the opposite of fast! This one often catches beginners. If your pH drops below 7, the bacterial growth in the tank slows down or stops altogether. So, make sure you test regularly and don’t be afraid to increase the pH if it drops below 7. Your master test kit has a pH test – use it! Most nitrifying bacteria lives inside your filter. This bacteria needs oxygen to survive and does so by drawing oxygen out of the water that passes through your filter. If your filter is turned off, you deprive the bacteria of oxygen. Keep your filter turned on throughout the entire cycling process. While the chlorine and chloramines found in tap water may be harmless to you and me, it’s lethal to the good bacteria. Don’t forget to use a good water conditioner to remove these nasty chemicals. Use it every time you add tap water to your tank. If you kill your beneficial bacteria, then you have start from the beginning. Temperature plays a major role in how quickly beneficial bacteria appear during a cycle – 65 to 85 degrees Fahrenheit is the sweet spot. Temperatures below 65F can cause the bacteria to grow 50% slower. A cycled aquarium that has already gone through the cycling process will be overflowing with that good bacteria that you are trying to introduce into your aquarium. If you take some of that bacteria from an established tank, it makes sense that it will speed up your cycle, right? This method works best if you already have access to a cycled tank. Not sure who to ask? Ask the pet store where you bought your equipment from. Otherwise, you could ask your local aquarium club… There’s at least one in every state! Remember: Beneficial bacteria coats surfaces, meaning that it does not exist in the water column. Taking water from a cycled tank will not make your tank cycle faster. Here are four ways you can rob beneficial bacteria from another tank. The best way, by far, to speed up the aquarium cycle is to install a filter that already contains the beneficial bacteria. Simply remove the filter from the cycled aquarium and add it to your new tank. FishLab Update: Good news! Angels Plus will ship a cycled sponge filter to your door for small price. The next best way is to season a filter. Simply install your filter in a cycled tank and run it alongside the existing filter system. After about a week, the beneficial bacteria from this tank establish themselves in your new filter. Now, all that’s left is to move it to your new tank. Beneficial bacteria also coat the substrate of a cycled aquarium. By taking a cup of gravel from a fully cycled tank and adding it to your own, you will significantly speed the cycle. Lastly, beneficial bacteria also coat the surface of plants. If you planned on creating a planted tank, buying plants from a cycled tank could be a great way to speed up your cycle. You could introduce some nasty stuff to your aquarium. Harmful bacteria, algaes and pests such as snails and hydra could all be hiding. Now, I must stress that most of these problems are very easy to solve, and it’s a risk you have to take if you choose to use a cycled tank to speed up your nitrogen cycle. Many aquarium brands now offer the concentrated nitrifying bacteria in a bottle to speed up the cycling process. The idea is similar to the cycled tank method – you add live bacteria to your tank so that they can establish quicker. Just how effective these products are is up for debate, but many aquarists swear that it helped their tank cycle faster. Now, part of the reason for the varying degrees of success is that the bacteria in these bottles are not equal. In fact, it’s not the same bacteria at all. You see, there are different types of nitrifying bacteria. While all are capable of eating ammonia and nitrites, only a few contain the nitrifying bacteria that will grow in your filter. When used correctly, these bacteria-in-a-bottle products can significantly speed up your aquarium cycle. Just be mindful that these are living products. If the bacteria inside the bottle runs out of food (past the used-by date) or the bottles have not been stored properly (excessive heat and cold kill the bacteria), the bacteria could be dead by the time it’s added to your aquarium. And, dead bacteria isn’t going to speed up your cycle. Using any of the above methods is a great way to speed up your aquarium cycle. The good news? You don’t have to choose one method over the other. In fact, many aquarists say that combining pre-cycled filter with bacteria in a bottle is the quickest way to cycle your aquarium. And, they might be right. Using this method, I have frequently seen tanks cycle in less than a week. Pretty impressive, huh? What did you do to speed up the nitrogen cycle in your aquarium? Let me know in the comments below! Hey there, great info! I’m an aquarium novice and had never even heard of cycling – I just set up my tank with water and substrate today and I was excited to add my axolotls tomorrow… but now I feel like I need to cycle first! But my question is… what should I do with the axolotls in the meantime? They are in a Tupperware container… can they just stay put with full water changes every other day until the tank is ready? Just what should you do with your aquatic creatures while their tank cycles?? Thanks! Admittedly, Axolotls are a little out of my area of expertise. However, I would assume it would be similar to fish in that you need to perform a fish-in cycle. The ideal is to not purchase tank creatures until your tank has cycled, but if it’s too late, then a fish-in cycle is the only way. I’d research further to confirm this is also the solution for axolotls. axolotls are amphibian & not fish, so cycling is less of an issue, but should still be monitored for water quality parameters. I had to restart my 30 gallon tank. I used the good established filter from my platty tank and I added bacteria and have the fresh water master kit. I got all my levels reading normal and put my 3 goldfish back in the tank but they are still acting stressed out! Am I missing something? There isn’t much information to go off here. It’s possible that your tank is too small for your gold fish. They need more room than you think. My husband and I had a 30 gallon tank that had been running for about a year and a half and only had 4 black skirt terras in there since the rest of our much older fish (from our previous smaller tank) had died. I didn’t know as much about the nitrogen cycle as I do now after getting a new 60 gallon tank for my husbands birthday. I made him promise that we would go slow and not add in any new fish until it was cycled. But he got the best of me and we have added some Cory cats, a few ghost shrimp, and a few other little tetras and a dwarf blue guarami. We used the existing gravel from the previous tank, and hooked up the existing filter and the new marineland one and ran them in tandem for about a week. I even took some of the cruddy stuff from the old empty tank and put it directly into the new filter hoping it would do something to help. This was about 5 week ago. All the fish are also a still other than one Cory cat that we just lost yesterday. We have been doing daily/ every other day water tests with the api kit. The ammonia is generally between .25 and .5, nitrites have always been at zero and we about a week ago used the safe start and our nitrates went from zero to around 5-10 (forgive me I’m trying to do this from memory). Our ammonia has never gone above .5 and if it does, we do at least a 25-50% water change. I have a few questions if you don’t mind. 1. When adding water, if we put in a dechlorinator first, can we use one of the hoses (one that connects to the faucet that can drain water and add water) and add water directly to the tank, or should we put it in a bucket and dechorinate it first before adding it in? 3. We moved our 30 gallon down into our bedroom and got a brand new fluval filter and new gravel. We are doing a fishless cycle and have been dosing with ammonia (believe it or not, dollar tree was the only place I could find some without anything added to it!) the ammonia is around 4ppm and nitrites have recently spiked way high, like off the chart high. My husband thought it might speed up the process if we added the safe start to this one as well so he added a bottle last night. The ammonia went down to around 2ppm over night but nitrites are still high and nitrates are around 80ppm? I am wondering where we are in the process for this one since the nitrites are way high now and ammonia still hasn’t gone down to zero. We have not dosed it with ammonia in probably over a week, and the tank is probably maybe 3 weeks old now? Was adding the safe start helpful for speeding up the process now! Is the ammonia still high because maybe there is food decaying from when we originally were trying to build up ammonia? Those are some good questions. I’ll start by saying that if your ammonia is readable, then something isn’t right, either your tank isn’t cycled yet or there is something else responsible for the ammonia spike. 1. Yes, when using a water changer system, you add the dechlorinator just before you turn on your faucet. For a 60 gallon, I’d use a water changer over a bucket, you’ll need a few bucket trips at this size. 2. If you didn’t dechlorinate the water prior to adding the gravel then yes, the bacteria in the gravel are most likely dead. 3. When readings get off the chart for a fishless cycle, I like to do a 50% water change or two. Each 50% water change will roughly the amount of nitrite and ammonia in half. You might have noticed that as the readings on the color chart increase, so does the distance between ranges. Even though it reads 80, it could be anything from 80 – 160. Getting the reading back down will allow you to see how quickly it rises and determine if anything is amiss. Just be mindful that you will need to re-dose with ammonia as a water change also dilutes this too. While there is no need to add bottled bacteria during a fishless cycle, It shouldn’t cause it to slow or stop either. I have 3 established tanks (a 30 long, a 37 & a 55 gallon). I just picked up a 125 gallon that I am planning on moving the inhabitants of the 55 gallon into (2 Electric blue Acaras & 3 “regular” Blue Acaras). I think they’ll be happier in the 125 (they’re all about 3 inches in length now, full grown is 6-8″). My plan is to break down the 55 gallon and start over once the 125 is established. I have a Fluvial fx5 for the 125. I was hoping that I could put my established Marineland 350gph hob filter from the 55 on the 125, as well as move the established 60g sponge filter (also from the 55). In addition I’m planning to seed the fx5 with extra media that is in the 5 tank as well as seed it with gravel from the same 55 gallon. I also have an under gravel filter being run by 2 power filters in the 55. I’m not planning on using an under gravel filter on the 125. 1) Would this be enough to hopefully “instantly” cycle the 125? 2) Will the under gravel filter in the 55 gallon be enough to sustain the Acaras until I can confirm the 125 is cycled? It sounds like you have already given this a great deal of thought, which is awesome to see. 1) It’s certainly possible that this will be near instant. Since the bioload of the fish being added is the same, it could instantly cycle it. But if you are not going to add the fish at the same time, then there is no source of ammonia to break down and the established beneficial bacteria will begin to die back without it’s food source. If you are going to add your fish, make sure you test frequently and keep a bottle of seachem prime on hand just in case. Thank you for your response. I will move the fish in with the filters etc. I haven’t finished preparing the 125. I’m going with a mostly slate tile bare bottom. I’m going to include an area of sand substrate, but mostly slate. I am going for easier maintenance with this tank. I’m going to also move the rocks from the 55 into this tank in addition to some new ones. Cichlids like caves etc. I’m going to add some power heads to help circulate and hopefully push most of the waste into the filters, so vacuuming during water changes is not as intensive and less stressful for the fish. If I set the caves up the right way I’m hoping to minimize disruptions to the inside of the tank during cleanings. In my other tanks I have to dismantle the caves to clean the gravel. I will post an update once it is up and running. I’m hoping to get it running this weekend. That sounds like a very interesting tank, I definitely understand the desire to have an easier to maintain tank. My 4 current tanks takes a good chunk of time each week to keep clean, but I enjoy it. I would love to know more about the success and flaws of this setup once you have spent some time getting to know the ins and outs of it. It sounds fascinating. I hope everything goes smoothly this weekend! Hi there. This is all very helpful, especially the Q&A! We were recently given a 30-gal tall by my mother; the manufacturing tag dated it as 30 years old. Because of its age, and because the silicone was peeling at the edges at ~90%, I decided it better to be safe rather than sorry, and reseal it. 1.) When should I begin testing parameters in this situation? 2.) I know it’s impossible to pinpoint, but, do you think my method will help speed things up? 3.) Should I go ahead and transfer the Amazon Sword? The fish-in cycle is a very dated method of cycling, it often kills the fish used to kickstart the cycle and isn’t considered humane. These days, we know that ammonia is what starts the cycle, and can add it directly, allowing precision measuring and recording. Fish-in cycle you are waiting for the fish to produce the ammonia and keeping a stable amount is difficult. For more info, check out my fishless cycling guide. I always suggest daily testing when cycling. This way you have an exact understanding of how much ammonia is produced and the rate at which it is rising and falling. It allows you to react immediately to any problems or irregularities as they arise. Using established tank media always speeds up the cycling process, so it will definitely make the whole process faster, a large group of bacteria multiply much quicker than one or two that are introduced in a fresh cycle. This is the logic behind those “bacteria starter” products, but those don’t work nearly as well as established tank media. Plants don’t affect the cycle and can be added immediately, unless they are ammonia sensitive. If I recall correctly, the amazon sword isn’t but I suggest doing your own research here. Would it be counterproductive to put all three seeding bottles into a tank together? SAfeStart, One and Only, and Nite-Out II? Assuming all bacteria is alive and the bottles have been stored properly, it shouldn’t make a difference. I am unfamiliar with Nite-Out II but the other two contain the same strain of bacteria, supposedly the exact same one that forms if you were to do a slow cycle. Since only so much can colonize your biomedia, adding more shouldn’t help. Going further, if all the beneficial bacteria in each bottle has actually died, it could possibly mess up your water parameters. I’m sorry to hear about your daughters cycling problems. It’s a lot of effort and given you’ll likely need to purchase extra equipment. Many independent fish stores sell pre-cycled sponge filters, which are often cheaper than buying a portable air pump and fish bags. Would it be simpler to source one of these from a fish store near her? Just an option that might make your life a little easier. Otherwise, you’ll need a fish bag, your tank water + gravel substrate, a portable air pump with an air stone(marina worked best in my aquarium air pump tests – see review section on this site) and a filter media bag. Fill your bag with tank water, add your media bag filled with gravel + filter floss. This will keep it weighed down at the bottom of your bag, so it won’t float around. Next, add your airstone and position it under the media bag. This will cause water movement to go up and through the filter floss ensuring all the beneficial bacteria gets oxygen, which as an aerobic bacteria, is essential for keeping it alive. Tie your bag up with the airline tubing poking through and keep the airpump on the outside. That’s all there really is to it. It’s going to be a chore, that’s why I suggested the buying a pre-cycled filter method first. What you suggest is pretty much what I was thinking, except for the weighing down concept. I have lots of extra equipment, and I wanted to purchase a 12 volt DC air pump for use in case of power outage anyway, so it is a good excuse to get that now. I will ask her about her lfs regarding a pre-cycled filter. Thanks. Much appreciated. Sounds like you are all over it. I’m glad I could clarify that you were on the right path. One more thing, I’d suggest bringing a spare set of batteries, just in case. Batteries always seem to run out during when you need them most. If I were to buy a cycled sponge filter to speed up the cycling, do I still follow the instructions on the no fish cycling page and do all the same testing? Thanks! Yes, this is spot on! Although if everything goes well, and you don’t accidentally kill the bacteria on the sponge, then you can probably ignore the suggested time frame in the steps. Also, you might find that you go from testing ammonia straight to nitrates, with nitrites remaining at zero the whole time. But by and large, everything else should be similar. I just set up my first planted tank. I did have a saltwater tank previously, so I had a base knowledge of testing and cycling. By day 3, I added a couple guppies. My water parameters all tested zero. My LFS chastised me stating my tank had not cycled. I wasn’t so sure. I had carib eco complete substrate, chocked full of bacteria. Added the turbo bacteria stuff the LFS sold. And had a good filter, oversized with huge sponge and ceramic biomedia. I keep testing and have maybe just now got 1 or 2 ppm nitrates. Never detected any ammonia or nitrites yet. I believe it was a instant, or nearly instant cycle. Heavily planted, so I’m sure it covered up some of the evidence of the cycling in the first couple days. I will keep testing and monitor this theory. But if anyone thinks they might try to quick cycle, I believe it’s completely possible. In very rare cases, I have seen near instant cycles. Often in planted tanks. But it requires the perfect setup, something that most beginners would not be able to achieve. Congrats on your success, but a beginner setting up a small tank with a betta for the first time won’t see the same results. Fish less- I used Seachem Stability as instructed on bottle in a 5.5 gallon tank. It’s been 2 weeks and I’ve done a couple little water changes to lower the ammonia, it was at 8ppm, my ph is 7.7 but still 0 nitrites and nitrates. I didn’t expect it to be done yet but I thought I’d see some nitrites by now. Should I try starting over with a new product? If I was in your position, I would drop the ammonia back down to 4 ppm. From here, if you wanted to add a bacterial supplement, use API quickstart or Dr tims one and only (it’s the same stuff) which is a very specific strain of beneficial bacteria, the one that is supposed to appear in your tank. Once you are back down to 4 ppm, I’d start testing as if this is day one of your cycle. Also, do you have a filter with biomedia, such as ceramic rings, for the beneficial bacteria to live in? I currently have well established 210 gallon, a 75 gallon and 2 outdoor koi ponds. (All are freshwater and have been up and running for years). I recently purchased a 38 gallon that will be solely for my beloved newest 3 South American puffers that are currently in my 210. I have a juvenile Arowana that will eventually get large enough to be a threat to my puffers. I’m pretty experienced in fish keeping but have very little patience. So here’s the thing. In setting up my new tank I decided to give seeding a try. In the new canister filter I placed media (the foam from my koi pond, and the floss from my 75 gal. It happened to be water change day, so I basically just transferred water from my 210 straight into the new tank about 75%. As well as 1 artificial and one real plant from the existing tanks. Also for good measure I tossed in 2 mosquitofish feeder fish that have somehow managed to escape becoming a snack as intended. I use API Master test kit and test AM & PM. As well as the 5 in 1 strips to double check, I also have a seachem ammonia monitor (that I understand may or may not be completely useless) I use it simply as an extra precaution for constant monitoring in case of random spikes. Is it possible that I have managed and Instant Cycle or is it still too soon to tell? I know the bb isn’t prominent in the water but I figured It couldn’t hurt considering otherwise it would be going down the drain. At the time I thought it was perfectly reasonable, but now I’m questioning weather the nitrAtes readings that I’m getting are simply existing in the old water as opposed to actually being generated within my biological filter? Long in short I completely understand the cycleing conversion process and that typically one would know that the bb is doing it’s thing once you have achieved and maintained 0 ammonia 0 Nitrites and some NitrAtes, which have been my readings since initial setup. So I guess I’m wondering if I’m just fooling myself with the existing nitrAtes that were in the existing water? It those are some beautiful fish you have and it sounds like you have a very good handle on things. In all honesty, it doesn’t seem like you need my advice at all and are just looking to bounce your thoughts. It is very likely you have managed an instant cycle. However, I dislike this phrase since if this is the case, your tank never actually cycled to begin with – the colony of beneficial bacteria is already established and all you have done is transfer it to a new location. You are quire right, the 10/20 ppm of nitrates is possibly existing nitrate from the water you transferred. I know those two mosquito fish will add ammonia on their own, but with such a small bioload for that tank, it could be some time before you notice your nitrates increase. The easiest way to tell would be to remove your fish and add 4 ppm of 100% pure household ammonia (be careful here, none of the stuff with dyes, fragrances or scents) You likely already have this on hand, otherwise it’s on the shelf of your local grocery store. If there is no trace of ammonia or nitrite after 24 hours, your tank is certainly cycled. This is probably the quickest way of testing it. Hi, I have some fish that I got from a school project but I’m not 100% sure how long it will take to have the tank cycled. I set up the tank(January 13th) and set it up with conditioner, heater(around 70 degrees F) and filter running. I also just today(January 14th) brought some of the old tank water home to jump start my tank. The amount of water that I put in filled up about 1/8 of my 15 gallon tank. How long do you think it will take before I can put my fish into this new tank? It will be done when its done. This can take a week. Or it can take a month or longer. Generally it’s somewhere in between. Use your test kit to determine what is happening. Never buy the instant cycle bacteria products from store. The bacteria inside are most likely dead from storage. Dr Tim’s is the only way to go. As long as you keep up with 10-25% water changes every other day, it’s ok to have a couple of fish. The bacteria need ammonia as a food source to survive. Fishless cycle you have to add pure ammonia o the tank and keep testing every day. Testing kit is required. Did you know that Tetra Safe Start is the same strain as Dr Tims? This is going back quite some time now but Dr Hovanec (Dr Tim) worked for Spectrum Brands owned Marineland while researching the beneficial bacteria. Long story short, Dr Hovanec started his own company, patents were shared and now Dr Tim’s and Tetra Safe Start are the same stuff. 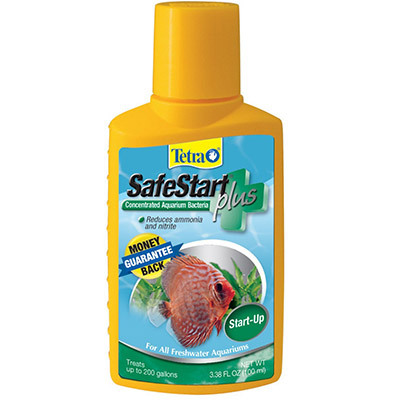 But Tetra Safe Start is cheaper and more commonly available, which is why I recommend it. My boyfriend recently bought me a 10 gallon tank. We were both told to have it running for 24hrs and it would be okay to add fish. After of course putting the conditioner in for the tap water and safe start for the fish. The tank has a filter and oxygen. I didn’t know about the cycling process. I set it up on Wednesday and got the fish on Saturday. I bought 4 guppies to see how they would do but now I only have 1 left. I did buy a master test kit. I guess I went wrong and added the fish too fast and skipped the cycling process. Do you know anything about Top Fin® Ready Water Preconditioned Aquarium Cycling Water Conditioner? Because if this last fish dies I have to start over and I don’t want to make a mistake again like last time. Or is there a way I can save this fish before it’s too late? I did test the water the other day. Ph was 7.6 but I got it down to 7.2 and high range ph was 7.4, no ammonia, nitrate, or nitrite. Unfortunately, big box chains like petco and petsmart have a bad reputation for providing the wrong advice to beginners when setting up a tank. There was never a chance that you could add your fish that quickly. Your only chance of saving your fish is performing a fish-in cycle. However given that three of the four have already gone, I don’t like your chances of saving this one. If he does pass on, you’ll be able to perform an easier cycle – the the fishless cycle. wrong. You can always add fish instantly. It’s called a fish-in cycle. You just have to do 20% water changes every other day and feed lightly. I’m well aware of what a fish-in cycle is. In fact, my fish-in cycle guide, covers it in great depth. However, this is bad advice to a beginner, as is “20% water changes and feeding lightly” without any regard as to what fish is in the tank. You are exposing your fish to ammonia and nitrite. I’d wager all things being equal, a fish not involved in a fish-in cycle will live longer than one that has. And that says it all. I agree with you that a fish-in cycle works, but it’s not a good solution for beginners who already struggle to grasp a lot of aquarium concepts such as parameter testing. You are essentially risking the life of your fish. Fish-in cycling is a dated method and should only be used as a last resort, rather than a go-to method. I have tried various methods and by far the fastest was to use cycled media from one of my old tanks in the new tank. I took a sponge insert from inside my old filter and put it straight into the new filter compartment on the new tank – it was cycled within the week. I am now setting up a 240ltr (55 gallon) tank which is significantly bigger than my others, and I’m not sure I’ll have enough existing media to help kick start the cycle, however I am going to try putting the sponge insert into my canister and see if helps. The store where I buy my fish (Franco’s aquarium) and supplies gave me the contents of an old filter sponge (squeezed the filter clean in a litre of cycled aquarium water. This really helped the process. I think you should expect this level of service from your own supplier. I 100% agree with you. Unfortunately many suppliers would prefer to make a quick dollar and sell you an “instant cycling product” instead. Sounds like you have found a great local fish store! Yes I have cycled my tanks this way with no problems. It will cloud the tank water badly (nicely) but it clears up in just a few hours. It is important to add a couple of fish while doing this, so that the bacteria has a food source. Always keep an eye on it by testing the water daily.